Definition - What does Bird of Paradise Pose mean? Bird of paradise pose is a standing balance posture which requires both stability and flexibility. The name comes from the resemblance of the body in this pose to the shape of the tropical bird of paradise flower. This pose is usually entered into from warrior two pose, by binding the arms under the bent leg, then stepping the back leg forward, and engaging the core to lift the body and the bent leg with it. The final stage is to straighten the lifted leg to come into the full posture. The Sanskrit name for bird of paradise pose is svarga dvijasana. 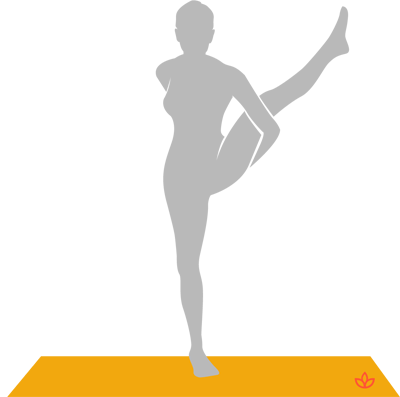 Bird of paradise pose is usually only attempted in a yoga practice once the body has been warmed up and opened with preliminary poses such as triangle pose, bound triangle pose and warrior two pose. As an alternative, it can be entered from frog pose. As well as improving the flexibility in the groin and hamstrings, bird of paradise pose can also help to open the muscles of the chest and shoulders. Due to the challenging nature of the posture, it can help to strengthen the muscles of the standing leg, improving balance and stability. The gaze can be lowered to make the balance easier, or raised for added challenge.